FOR THE VENDOR PLATFORMS USE INTERNET EXPLORER ONLY Please note that any other web browser (Chrome, Firefox, Safari etc.) are not compatible. Vendors who are currently not on the SANBS vendor database can register by using the SANBS online vendor self-registration form. 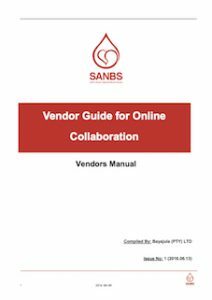 Note: Suppliers that are not on SANBS database should register themselves on the SANBS website before partaking in any tender opportunities. A non-compulsory briefing session will be held on 05 February 2019 at 14h00 at SANBS, 1 Constantia Boulevard, Constantia Kloof, Ext 22, Roodepoort. Compulsory briefing session will be held on 14 February 2019 at 10h00 at SANBS, 1 Constantia Boulevard, Constantia Kloof, Ext 22, Roodepoort. Service Providers are invited to participate in a process to appoint a Panel Attorneys. Panel of Attorneys 11/03/2019 Compulsory briefing session will be held on 19 March 2019 at 10h00 at SANBS, 1 Constantia Boulevard, Constantia Kloof, Ext 22, Roodepoort.